The large Tudor jetty at Greenwich Palace extends into the river much further than is visible. 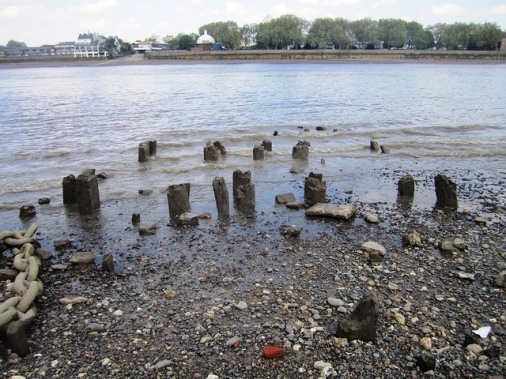 At the lowest of the low tides you can see eddies in the river tantalisingly suggesting the location of submerged piles, and several Greenwich FROG members have got soggy socks over the years trying to get photos of some of the timbers in the ebb of a Thames Clipper bow wave. 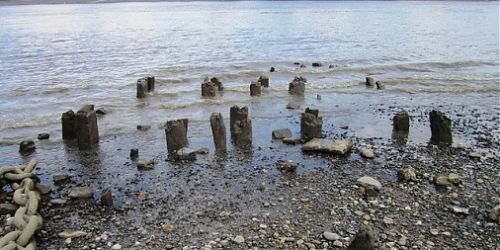 It seems that there is at least one more bay of timbers which we have never seen out of the water. 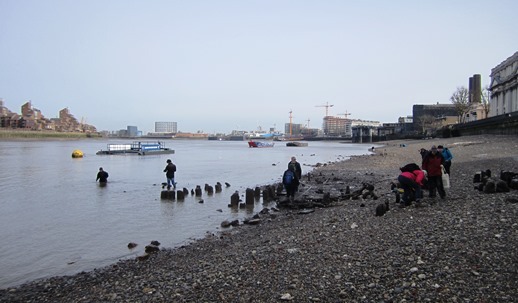 But we’re a foreshore archaeology project, and not an underwater archaeology project, and we’d come to accept that there would parts of the jetty that would always be unknown to us. That all changed at a TDP event last year, when I was pulled out of the coffee queue by another FROG volunteer: “Come and meet Nicola, she has a dry suit, she wants to come down to Greenwich”. I’ll be honest, I’ve had some random conversations since I’ve joined the FROGs, but that did leave me a touch lost for words. Nicola turned out to be lovely, and she did want to come down to Greenwich, with and without the dry suit. It’s taken us a little while to coordinate, but finally, last February, the tides were predicted to be particularly low, and Nicola brought along her dry suit. Once she was all suited up (not an easy task! ), she fearlessly strolled out into the Thames to see what she could find. I have to say, she is a far, far braver woman than me! Most of her exploration had to be done by touch as the Thames was murky as usual, and there was very little visibility in the water. We had several people on Clipper watch to make sure she didn’t get caught by a stray wave, luckily it was early on a Sunday morning, so there weren’t too many to contend with. Nicola found there are timbers over 5 metres beyond the modern low water level, which means the entire known length of the jetty (from the first piles that are visible at the top of the foreshore) is over 29 metres, and suggests that there are a couple more bays to the structure below low water. The jetty is one of the largest archaeological features on the foreshore, and when it was in use it would have been one of the most impressive structures on the river. If it was the access jetty for the Royal Palace, as we suspect, it would be frequently used at low tide, as the boats came down with the tide from the city, so it would need to stretch out quite far into the river. Thanks to Nicola, we’ve now got a much better idea of it’s length, and there may even be more to it, but to find out we really would have to become underwater archaeologists!